Hidden in the bayous of south Alabama, Magnolia Springs is a 600-acre postage stamp of a town. I have yet to meet anyone who has heard of it. Even my mother-in-law, who lives an hour east in Pensacola, told me its name didn’t ring a bell. So when my husband and I arrived there, I was surprised by how familiar it seemed. A canopy of live oaks shaded the main road, and homes stood on wide lawns framed by picket fences and dotted with magnolia trees. Turning into the driveway of the town’s namesake bed and breakfast, complete with a wraparound porch, I put my finger on it: The whole place felt like a scene out of Forrest Gump or Fried Green Tomatoes. Turns out, I wasn’t far off. 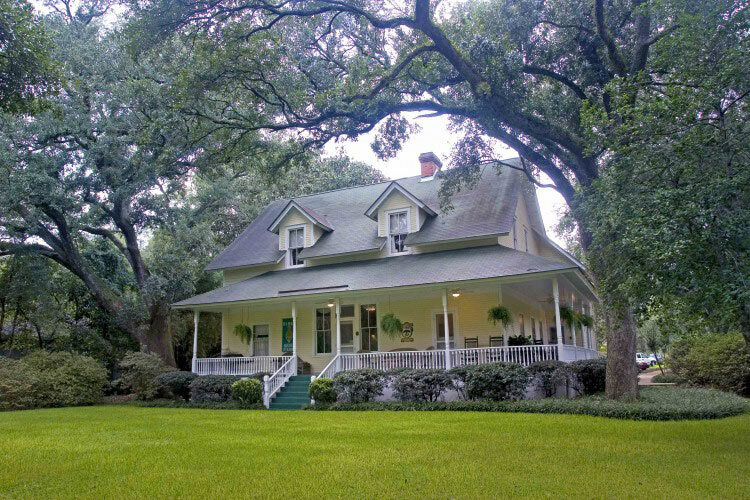 Forrest Gump author Winston Groom used to live in Magnolia Springs, and Fannie Flagg kept a home here while writing Fried Green Tomatoes at the Whistle Stop Cafe. She also based the characters and the fictional town in A Redbird Christmas on Magnolia Springs’ salt-of-the-earth residents and unhurried way of life. He told us to check out Magnolia River from the private dock across the road—“Tell ’em David sent you.” On that dock, we found a mailbox. Turns out the riverfront homes here still have their letters delivered by boat. Throughout our stay, we took note of the two-story inn’s special details, like heart of pine floors, stained-glass windows, and original chandeliers. Our suite was trimmed in curly pine, and the wavy-glass windows looked onto the live oaks whose branches curled toward us as if ready for an embrace. In the evening, we nibbled chocolates Worthington left for us at turndown; in the morning, he served us a three-course breakfast. As we left town, my husband at the wheel, I turned to watch the live oaks fade from view. Thanks to two bestselling books and a little Hollywood magic, Magnolia Springs is a place I came to know long ago—yet the town proved a true discovery.